We develop B2B and B2C integration systems that have the ability to engage customers, suppliers, distributors, employees and partners through systems that include broad communications capabilities to support interaction, collaboration, data exchange, along with safety and efficiency. Guidelight's integration team works closely with you to help define your core set of business rules, requirements and functions giving us the ability to leverage the proper functionality within your B2C or B2B Web environment. We offer custom tailor solutions built on well-defined requirements based on strategies that can be used and reused across multiple Web applications to ensure the needs of your user community are best met. 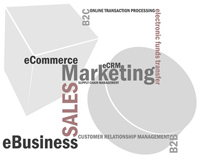 Why Guidelight B2B and B2C Application Integration? For more information about our B2B and B2C Application Integration services, or to simply get a quote for your B2B or B2C application integration development project, please contact us.